DBR announced its expansion into the cruise ship industry following a partnership with a Dutch engineering and installation company in the marine and offshore industry. The latter company is currently working on a project that involves the upgrade of the electrical safety system onboard two cruise vessels. For the first time, DBR used its knowledge of and experience in the worldwide marine market and classification rules to deliver the power supply for cruise vessels, the company said. To avoid any blackout situations while the cruise vessels are in operation, extra power demand in case of emergencies is required. 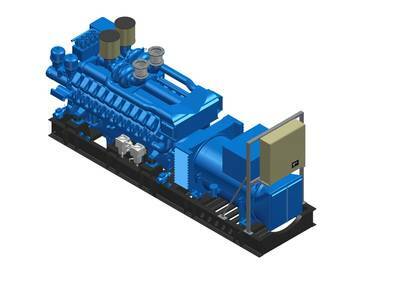 DBR will deliver one power generator set for each cruise vessel to provide this additional safety feature. Weight-to-power ratio was one of the most important issues, because the generator sets will be placed at the upper deck of the vessels. One of the cruise vessels will be equipped with a 3,250kVA generator set, a DBR marine-type DXL3250URS2 unit with MTU 20V4000, and a Leroy Somer LSAM54 generator. The other vessel will be fitted with a 2,625kVA generator set, a DBR marine generator set type DXL2625URS2 with MTU 16V4000, and a Leroy Somer LSAM56 generator. Part of DBR workscope will be the local control panel for monitoring and a dedicated cooling system by means of remote radiators with electrical fans. The DBR generator sets will be tested in house and certified by Lloyd’s Register. DBR will supply the generator sets to a Dutch-based shipyard that will build each generator set in a dedicated modular deckhouse. Placement of the generator sets will be in a transverse direction because of an omni-directional inclination of 25 degrees that is required to meet the Class Society requirements. These MTU engines will be equipped with special “deep” oil pans in order to ensure a high inclination. The generator sets will be placed on a purposely-calculated/-fabricated heavy-duty base frame with marine-qualified shock absorption to prevent vibrations. Production commenced in October 2015 and delivery is planned this year.